Registered under a regulatory body. English, Arabic, German, Spanish and Russian. The company does its best to help customers make the maximum amount of profit possible, by offering the best and newest instruments that are being offered by the best companies in the field of modern technology. 12Trader is a licensed company, and is subject to the FSPregulatory body. Our website is smartly designed, which makes it easy for any client to find out what he/she needs and also makes communications easier. Simplicity is the core belief of our company, and we do our best to maintain that in every aspect of our operations. 12Trader’s technical support team is the best as each member has many years of experience in the technical support field. Our reason for assembling the best technical support team possible, with the strongest capabilities, is to ensure that we are able to solve whatever problems any client might face. Withdrawing and depositing with us is a piece of cake. Within a couple of minutes, you will be able to withdraw or deposit as much as you wish. Furthermore, we provide multiple depositing options which include all the common payment methods either through bank transfers or credit cards. We provide our services in multiple languages to ensure that we are able to reach traders from all over the world easily. Personal account managers take care of every client, to provide guidance through trading via the direct signals service. Furthermore, the live events have been tracked with the help of our best experts and analysts in the market. You could contact our company through live chat, phone, email or fax. You won’t have to wait for a week to get a response, like some other companies, as we make it our mission to provide timely responses to all our clients. Top-notch, sophisticated platforms make the trading process easier. For this reason, we provide many such platforms to fulfill our customers’ needs. Our primary platform is the IGPlatform which needs no downloading or installing. All you have to do is to open your browser and start trading with one click and through social trading, which offers support and guidance for all our traders. Another mobile trading platform has been offered by 12Trader, and this allows investors to trade easily and achieve profits anywhere and anytime. 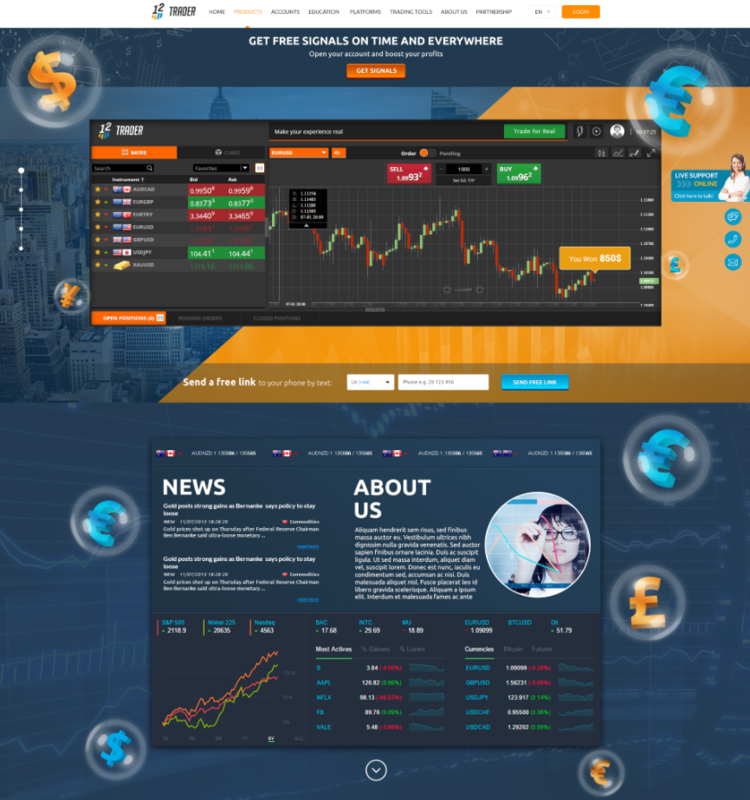 12Trader has surprised all its investors with its great performance, its easy-to-use and safe platforms, and also its high speed depositing and withdrawing services. Finally, we support credit card usage to save the investor’s time.